Puffins off Peel, Paddling Perspectives... and more! A warm and sunny hello from Adventurous Experiences! The summer of adventure is upon us and we’re informing you of some of the exciting experiences we’re providing. Adventure Week 2009 – FESTIVAL WEEKEND! Outdoor based festival with our key service areas of Safe, Fun, Learning running through all activities. Shared experiences, progression, journeying and discovery. Incorporating the 7th annual Sea Kayak Symposium. A fantastic social including the rousing Saturday evening Ceilidh! Guest Instructors from around the world! Places are limited. To Book and get the latest information – check out the Adventure Week online. On the lead up to the weekend there are also activities running daily, run by a variety of guest coaches in addition to Adventurous Experiences staff and opportunities for formal qualifications in sea kayaking to be undertaken. Following the festival commencing 18th August sees the Circumnavigation of the Isle of Man by sea kayak, a 4 day mini-expedition including wild camping – a great personal challenge and one that is open to varying levels of ability. 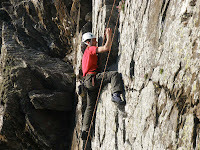 For further details check out the Adventure Week online. We continue to update and modify the information online, so the website will host the most up to date information. The ‘Calendar’ of scheduled events now displays the day as well as the date, for easy reading. The Calendar is a selection of adventures on offer for simplicity at the booking stage. We provide experiences every day, all year, for individuals, couples, small family groups and friends, corporate events, and larger groups up to and exceeding 100 persons. To book an experience not on the calendar or make a group booking, please contact us with an outline of your preference and we’ll do our best to make it happen. The program forms a large part of our commitment to raising the level of outdoor skills and safety on the Island. The team of 7 students training for the Norway Expedition this summer are presently undertaking the hill walking part of their practice expedition down the length of the Isle of Man. More details on our Youth Scholarship program online. Due to the increasing demand for our ‘combined rock and water activities’ we have expanded our staffing in these areas and have a group discount of 1 goes free with every six persons. Individuals and smaller groups are also welcome. We welcome Rebecca Goodson to the staffing team. Rebecca has trained on the Youth Scholarship Program, and has joined us this summer in the role of full time office administration and assistant Coach. Becca will also aid the development of the website, and greater efficiency all round. And many of you will have seen Sam Murphy is with us again for the summer, fresh from his first year of studies at Bangor University. Alongside this, our continuous staff training and development program show our commitment to continue to be the leaders in Outdoor Education on the Island. Recently, staff have benefited from training at the Anglesey Sea Kayak Symposium and a mini-expedition on the committing north coast of Ireland as part of their own personal development. The Adventure Club is seeing continuous growth in its member base, with many of our students using it to also gain British Canoe Union awards. A one off annual fee of £75, allowing members to benefit from greatly reduced rates per activity session. Welcome to our new members who have joined recently. Congratulations to Gary & Emily who gained Member of the Month for June! After completing a beginner’s course on the sea, and purchasing their own kayaks and kit, they joined the club recently to make use of the ‘progressive learning program’ and friendly socials. They have shown good progression and a high level of commitment. Tuesday evenings 6:30 till 7:30 pm - every week. Price £12 for 4 sessions. Please contact us to book your place! Lastly, our Sea Kayak Trips and Evening Paddles remain very popular, and advance booking is advised! As always, you can catch up on previous adventures via the Adventurous Experiences Blog, with photos, write-ups and comments. We welcome your feedback on our services, and look forward to seeing you soon. sunset off Peel .... contentment ... ! 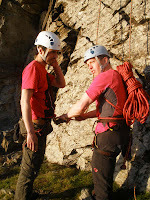 "Keirron, thanks for a fantastic afternoon out, I still can't quite believe how much I enjoyed the coasteering - awesome. Thanks for the professional guidance! Tomorrow we are back playing cricket for the MCC..."
BBC Coast were filming as we finished the session with another quick dip into the bay! Here's a few glimpses from yesterdays beginners Sea Kayak Trip from Peel - with sunbathing seals doing backstroke beside the kayaks, Puffins bobbing around nearby and constant commotion from the nesting Guillimots and Razorbill populations! The Sunday kayak trips went from Peel, Fenella Beach this week, with hot sunshine and a calm sea :) Individuals selected the level of challenge they desired - and different groups headed North and South, exploring the various caves, channels, observing the abundant birdlife and generally enjoying the fantastic summer!! The view from a sea kayak is second to none. Peering into the clear depths and gazing up at the towering cliffs and vivid rock formations - the perspective and feeling this gives is very powerful, humbling and immensely satisfying... Contentment is the description given by many. "Many thanks for an excellent day last Saturday all the guys have mentioned how much they enjoyed it and keep pestering me to see the pictures from the weekend! Dave really appreciated the tryout of coasteering in lieu of his Kayak outing. The talk now in the office is of gorge-walking..."
a relaxing paddle yesterday out of Cornna (a favourite spot for family picnicks too) - with plenty of wild goats, cormorants and shags to spot along the way.. landing for a break on Dhoon Beach, with time for a quick sunbathe, before returning. "We have had a very good and very nice sea kayaking trip with you last Thursday. ...Once again, we want to give you many thanks. We really enjoyed this very good and very beautiful event." Situated off the North coast of Ireland, a committing place to paddle with powerful tides, stunning scenery and vast colonies of Guillemots nesting along the towering cliff faces. Many thanks to Oisin for organising the new SKUK Romany LV for me to use, in gorgeous pink! observing Basking Sharks... from a sea kayak!